I’ve been reading The Media Equation, by Stanford’s Clifford Nass and Byron Reeves. A quick read and yet I’ve been struck by how quickly I changed my mind about its main thesis. The basic premise is that people treat computers like people – since we have old brains and in the past, everything that seemed real, was real. We are hard-wired to react (prior to thinking about it) that what we’re seeing is real and so, we have physiological and psychological reactions to media that mirror our reactions to other people. Consciously, we know the representations of what’s in front of us are not real, but we do not react as such – most of the time. We feel connected to media in the same automatic ways we feel connected to the real world. Our old brains, our lizard brains, have not caught up with new technology. This work was originally published in 1996 and was fairly controversial. Since then, the thoroughness and overwhelming consistency of the research has grown a healthy following and body of related research in the field of Human Computer Interaction. I would like to posit that Ze Frank has read this book. I would like to further posit that Ze Frank is genius and he has taken Chapter 3 and made it his own during his work on The Show. Chapter 3 of The Media Equation works through a series of experiments where people are shown a series of shots from different distances and at different sizes – all of the human head/body. The participants were questioned afterwards and the faces that had the most impact on the viewers were the ones with screen-filling faces and that seemed ‘closer’ to the viewer, those with the least interpersonal distance. This matches directly with prior social science data whereby we interact more deeply and remember better those people who are physically close to us. It’s how we’ve developed over a few hundred thousand years. Only this time, it was representations of people, not real people. 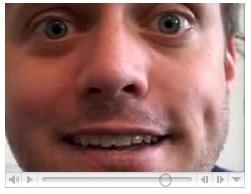 Ze has taken this to the extreme with his screen-filling shots from his chin to just above his eyebrows. His entire head does not fit within the screen. This extremely close crop forces the viewer to pay attention to everything Ze has to say and not be distracted by anything else in the shot. I would guess this magnifies his audience’s feelings about his topic for the day. The viewers feel a closer connection to Ze than if he had decided to shoot The Show from a few inches farther out. Ze has used Reeves and Nash to his advantage, and leveraged his understanding of (viral) media to boost his show’s popularity. We feel a connection to Ze that we do not feel with other broadcast personalities. Posted by Terrell Russell on Friday, September 1, 2006, at 3:34 pm. Filed under lizard, media effects, media equation, ze, ze frank. Follow any responses to this post with its comments RSS feed. Both comments and trackbacks are currently closed. Nice insight! I had a few drinks with Ze one night in Brooklyn, a few weeks ago. Smart guy, and he knows it. I think the personable style is a bit of a sham, but whatevs. He’s funny. Linked to your post from Reel Pop. Cheers, -s.
I’ve been thinking a fair bit about this over the last week or so. I went back and watched all Ze’s episodes going back to March and was interested to watch how his on-screen style developed over that time. I hadn’t realised that there had already been research done on this (although not surprised), but what had struck me about the framing within the context of the page was that it felt as if Ze was on the other side of the screen, peering at me through a 400×224 rectangular window. My mind instinctively created the rest of the person, placing it beyond sight on the other side of the opaque page. This whole “up close and personal” feel for internet and mobile content seems to be a hot topic at the moment, and while I was initially appalled by what I was seeing, Ze’s work has made me rethink my TV training. But if I have a lizard brain, why can’t I do all those crazy things with my eyes that they can?! I have fun watcing Ze, but it doesn’t feel as if Ze “lives in my computer”, so to speak. I guess I see his shot strategies as a device to force his viewers to hear what he has to say, and not be distracted by Ze the person. Though, if you enter the forums on his site lately the viewers are starting to get a leeeeeetle personal and a smidge, erm, skeeery in some cases. At least the Hard Charger types are. The SportsRacers and Duckies are still cool. I love his show! I’ve often wondered why I don’t mind his face filling the entire window, and maybe your idea is true. Stil he is also very good at editing his clips so that they keep you engaged and his sentences are snappy and flowing from one point to the next. His bio says he studied neuropsychology. Is this some sort of experiment? Very powerful and potentially lucritive informantion. Is this really so surprising? Close-ups that fill up some rectangle with a human face are an extremely common late-20th century design idiom. It’s so common that most people hardly even notice it in television and film dramas, in the head-shots of hopeful actors, in advertisements, in promo portraits, etc. etc ad nauseam. I think Ze’s show is great, but I don’t think he has to be a genius or a psychological brainiac to simply observe that an extreme close-up is more involving, particularly since the whole frame in his case is only about the size of a postage stamp. The close up also shows his expression more clearly and his messy desk less clearly. Ze Frank flexing the cognitive neuroscience techniques, methinks…. … so we don’t have to. >>I would like to posit that Ze Frank has read this book. I would like to further posit that Ze Frank is genius and he has taken Chapter 3 and made it his own during his work on The Show. « Consolidation, paranoia, and IM-creeps oh my!